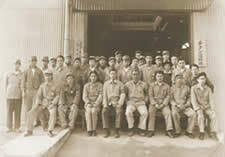 Kobe Steel began research and development of titanium in 1949, and has since contributed to the growth of diversified industries for over 50 years. Cumulative production of titanium reached 100,000 tons in the 50 years since the start of production (as of 1999). This is the largest volume in Japan. The integrated production line from titanium melting to final products provides consistent quality design and quality control. Kobe Steel is authorized as the titanium supplier by aircraft and jet engine manufacturers both within Japan and abroad because of our highly-regarded forging technology, integrated manufacturing system, and supply record. In 2001, Kobe Steel became the first Japanese manufacturer to be authorized by Rolls-Royce plc as a supplier of compressor discs for their jet engines. We are one of just seven companies ever to have been authorized as suppliers of titanium and other materials. As a titanium pioneer, Kobe Steel has continued to produce high quality titanium products in our own Production facilities, best suited to titanium manufacturing. VAR furnaces, continuous annealing-pickling line, vacuum annealing furnace, tube welding line, ring rolling mill, etc. Production of various titanium materials from commercially pure titanium to titanium alloy corresponds flexibly to diversified product shapes, for example coils, sheets, plates, welded tubes and forgings. Kobe Steel has successfully developed the materials, joining technology and functional surface treatment technology to meet any user needs. With our accumulated material design and processing technologies, Kobe Steel has contributed to the commercialization of various titanium products from golf clubs to jet engine components. Our expertise allows us to achieve low-cost and rapid development. The technologies developed by Kobe Steel as Japan's titanium pioneer have greatly contributed to today's worldwide use of titanium. Kobe Steel has received numerous awards from various organizations for the range of technologies we have developed.